Planning for breakfast becomes tough when all you think is Dosa or Idli. So to make things easy for us, a day is allocated for Bread with whatever each likes. 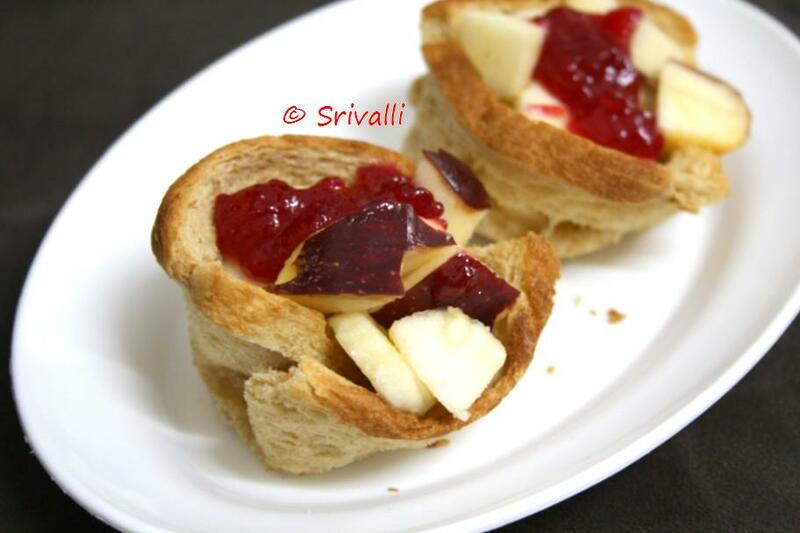 Bread with Cheese Slices, Cucumber Sandwiches, Bread with Jam and even these Cheese Spreads that we get these days become very attractive to my kids. Nutella that I got from SFO is finally over and though I saw this supply at Nilagris, just when I needed, it is not available. So I got these Cheese spreads that come in different flavours, like Masala Magic, Cheese with Peppercorns, With different Peppers mixed in. Mexico Cheese. Well all these attractive Peddu and Konda a lot, while Chinnu will not even taste it. I sent a Sandwich with Cheese Masala for Peddu’s breakfast yesterday and he came home asking for it again. So today was again Bread with Masala Magic Spread. That reminded me that I was wanting to make something different with bread. I saw this on some kid’s website and knew kids will love being served this way. I made it with both Jam and then Savory. I concluded that not only kids will love it, I enjoyed it too. This could be a great party appetizers. Grease the muffin tray with butter. 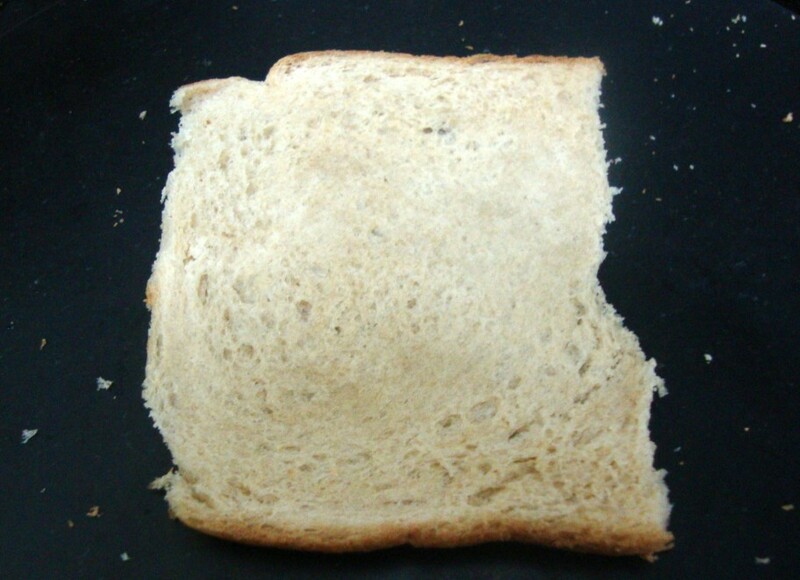 Trim the sides of the bread slices and press it down to a flat sheet using a rolling pin on a board. Press down these pressed slices on to the greased muffin tray. 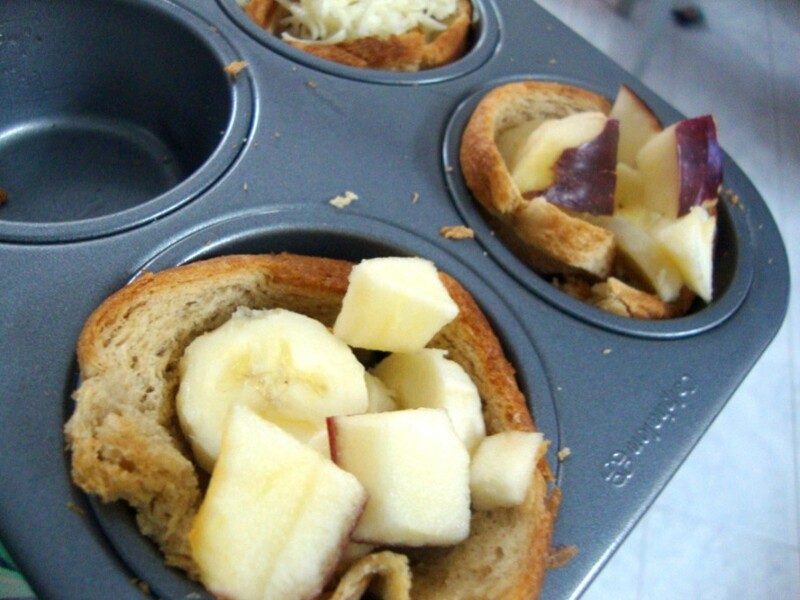 Chop banana and apple into small pieces and fill into the baskets. Either fill the jam over the fruits or on the base and serve. Trim the bread slices, roll them flat using a rolling pin over a board. Press them down into the muffin holes. 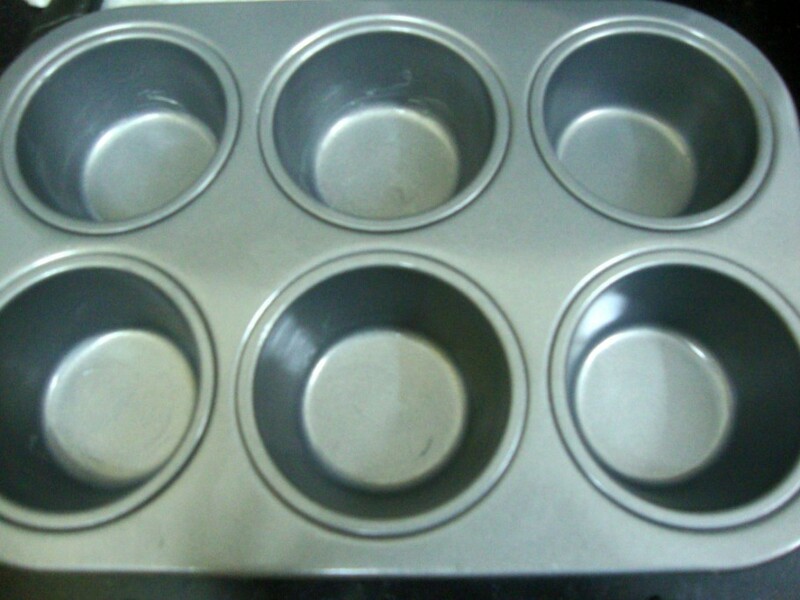 Ensure they cover the sides so as to form cups. To make the filling, chop the fruits into small bite size pieces. If the Jam is thick, mash it with a spoon to get a dropping consistency. Scoop the fruits into the baskets, top it with Jam. 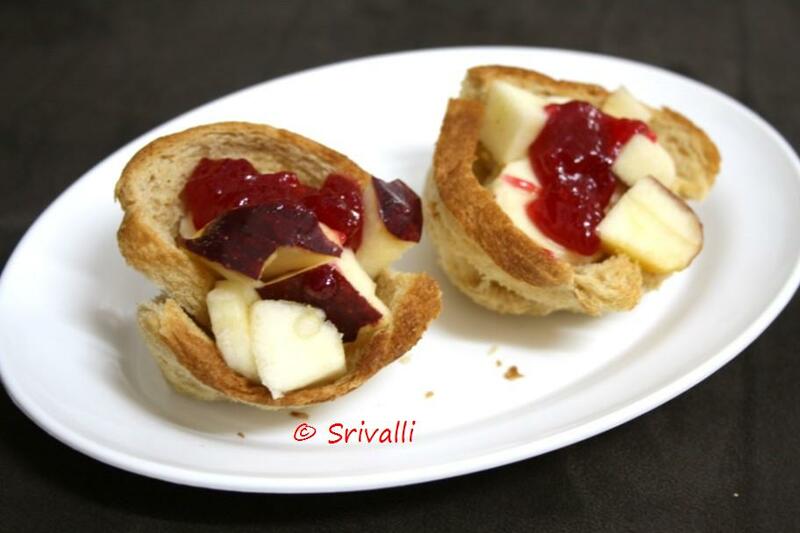 you can also add some Jam to the bottom below filling it with fruits. The bread were very crisp and didn’t turn soggy or soft after standing out as it normally happens. I found it too sweet this way, but for kids it will be prefect. The savory ones were much more tastier than these. But then of course little ones love sweet treat. Come back for the Savory version tomorrow. Wow Valli!! 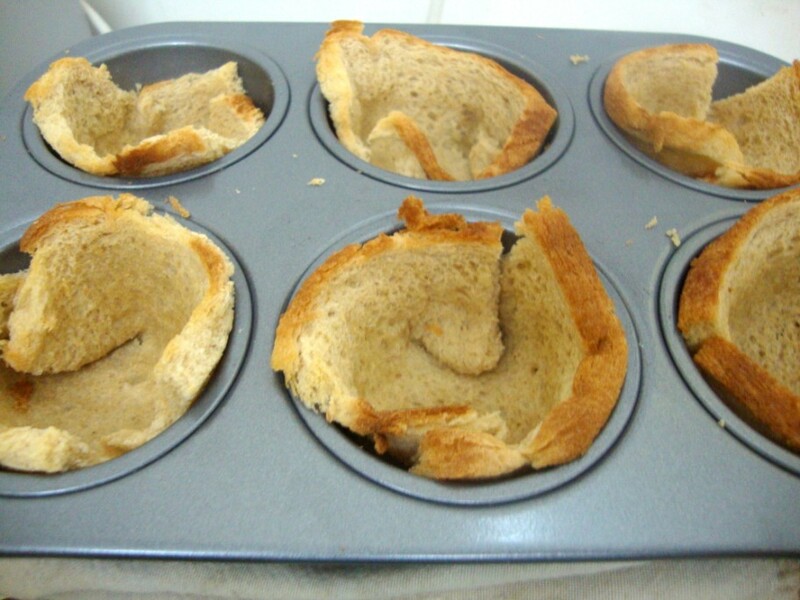 cing the pic i thought it was baked this way!!! Nice Idea to steal some fruits into their Diets!!! Wwow damn pretty and prefect for kids snacks..
thats a great idea!…a great kids party snack! Nice idea, valli….I'd love to see the savoury version. Bread baskets are so cute! what a great idea ! loved it ! !